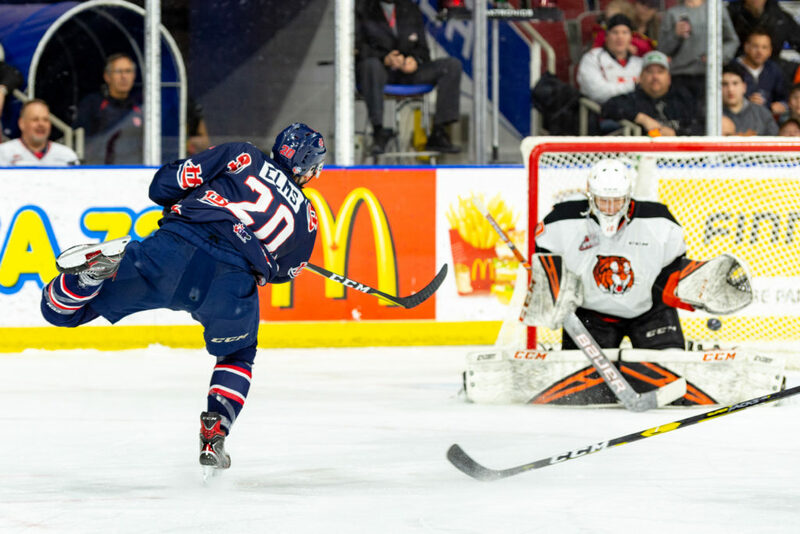 Lethbridge, AB – The Lethbridge Hurricanes played their final home game for February on Friday as they earned a 6-3 win over the Medicine Hat Tigers at the ENMAX Centre. The Hurricanes were flat-footed out of the gate and the Tigers jumped out to an early 2-0 lead. Medicine Hat opened the scoring at the 3:43 mark as Corson Hopwo redirected a puck home to make it 1-0. Tigers added to their lead at 6:05 as Ryan Chyzowski scored a power play goal to make it 2-0 early. The Hurricanes answered back as Jake Elmer reached the 30-goal plateau as he scored for the seventh straight game while four-on-four at the 10:45 mark to make it 2-1. The ‘Canes tied the game on a power play as Logan Barlage banged home a rebound just 2:56 after Elmer’s goal to make it 2-2; Igor Merezhko and Dylan Cozens earned the helpers on the tying goal. Lethbridge took the lead for the first time early in the second period as Jake Leschyshyn tapped home his team-leading 34th goal of the year at the 3:34 mark to make it 3-2 Hurricanes; Nick Henry and Barlage picked up the assists on the goal. The ‘Canes made it 4-2 when Taylor Ross scored his 30th goal of the season at 12:27 from Henry and Ty Prefontaine. Medicine Hat cut the lead to one as Hopwo was credited with his second goal of the game as the Hurricanes led 4-3 after forty minutes. In the third period, the Hurricanes added to their lead as Jordy Bellerive ripped home his 26th goal of the season on a power play at the 14:50 mark; Cozens and Elmer picked up the assists on the goal. Bellerive added an empty-net goal for his second of the period and 27th of the season to seal a 6-3 win. The Hurricanes outshot the Tigers 40-34 on the night. The ‘Canes went 2/6 on the power play while going 7/8 on the penalty kill. The win for the Hurricanes improved their record to 4-1-0-0 in their last five games as they improve to 31-17-5-5 on the season. The ‘Canes, who sit second in the Central Division, now have a five point cushion on the Tigers. The Hurricanes will begin a five-game road trip on Saturday when they visit the Medicine Hat Tigers at 7:30pm. Tickets can be purchased online at www.enmaxcentre.ca, by calling 403-329-SEAT (7328) or by visiting the ENMAX Centre Ticket Centre.